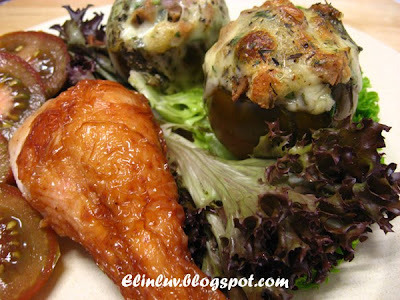 I had no idea how I am going to cook then when I bought them….use them in salad or soups sounds very plain so I decided to bake them with black pepper sausage bits and mozzarella cheese instead….awww this sounds delicious isn’t it? You can either served it as Entrées or as accompaniment to your roast chicken. 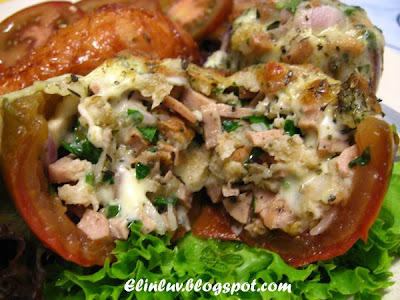 the sinfully rich cheesilicious stuffed kumato tomato. See the mozzarella oozing out.......so yummy and flavorful! contributed something wonderful to my belly LOL! Wash and clean the kumato tomatoes, cut off the top part and scoop out the seeds. Mix ingredients A together and leave it to stand for 15 minutes. Preheat oven to 175ºC . Stuffed the kumoto tomatoes with the combined ingredients A. Place them on a baking tray greased with olive oil. Top it with mozzarella cheese and mixed herbs. Drizzle generously olive oil on the kumato tomatoes and baked for 20-25 minutes till the mozzarella cheese is oozing over the kumato and crispy brown. Serve immediately.
" Part of the secret of success in life is to eat what you like and let the food fight it out inside. " I had never heard of a kumato before this post. Now I will have to keep a watch out for them at our local market. Lovely stuffing! I don't know this tomato, but I do know that I want one right now!!! Very nice pics. Haven't seen those tomatoes before, will keep an eye on it the next time I go to JJ. I am so making this. I love stuffed bell peppers and stuffed tomatoes...opppsss...I meant kumatoes! I don't see any kumato here...they look so cute and must have tasted great with melting cheese atop. Omigod, your kumato has been prepared to its fullest, I'm gonna steal your recipe, thanks Elin! Looks yummy! I could do this even with a regular tomato (since I don't see kumatos at the market). Yum! 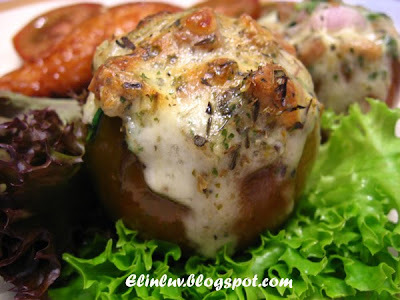 i love stuffed bell pepper/tomato/eggplant with lots of stuffing and lots of cheese. just like yours! @ reanaclaire : LOL! I can imagine that! @ Quinn : haha..you try it once, you will forever crave for it...that good! @ Angie's Recipes : Hi Angie, they are cute n I love the color and taste ! Good for salad too. @ J2Kfm : Hi James, haha did you read my quote for the day...at the end of the post? Eat and let the food fight it out inside LOL!